*_* love it! Thank you-u-u! MEEP! My gosh... I wanna watch this episode! Can't believe I said that when I have watched the whole series! But, This Picture... Sebastian in a coffin and Ciel touching Sebby's cheek. Oh sorry, Thank you, thank you for sharing this! Good bless you for such a kind deed! 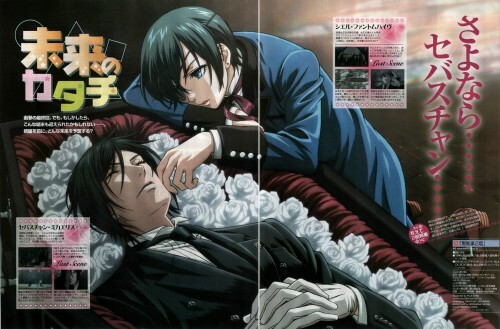 I like this pic but the sentence "Goodbye Sebastian" is a bit sad. OMG! Just great picture! Thanks a lot, I couldn't think about some scene like this..
thank you! thank you! thank you very very much for this amazing image! Oh this is beautiful! Thank you so much for sharing! OMG.OMG.OMG.OMG. I THINK I JUST DIED ON THE INSIDE.. IN A TOTALLY GOOD WAY THOUGH.